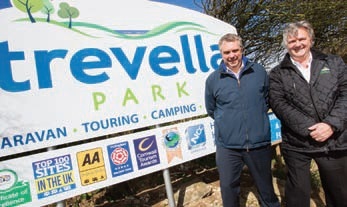 St Austell and Newquay MP Steve Double praised Trevella Park for its continued growth. Trevella Park in Newquay has been praised for its contribution to the local economy, following its year on year growth. In the last five years the park has doubled its number of permanent team members to 20 and brought in extra 35 seasonal employees to help cater for a big increase in holiday bookings. St Austell and Newquay MP Steve Double recently visited the park and was shown the latest accommodation development, which will add more than 30 luxury caravans to the site and bring new holidaymakers throughout the year.